Anna has been practicing yoga since 2001 and qualified as a Hatha Yoga teacher with the British Wheel of Yoga. 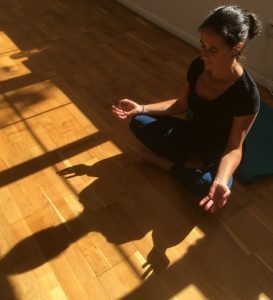 Anna has also trained with Yoga London to teach Antenatal and Postnatal classes. Classes are informal and friendly and start with breathing practices followed by yoga postures which are adapted to individual needs. Come and enjoy an energising lunchtime Hatha yoga class so that you can start your afternoon feeling refreshed and calm. Breathing exercises are not only a great way to start your practice, they open the door to renewal, inner strength and balance. We all need to come up for air occasionally and by re-learning how to breathe naturally and efficiently we can take that vital first step towards relieving stress and anxiety. The physical practice helps to maintain and improve flexibility, stability and strength. Classes run on block of 6 sessions, but you can join at any time depending on availability.